Bridge Street Development Corporation has announced the return of Feast BedStuy crawl to Malcolm X Blvd., Tuesday, April 5. The event will highlight new and existing eateries along an eight-block strip, including L’Antagoniste, Casablanca Cocktail Lounge, Daddy Green’s Pizza, Doc D’s, Natural Blend Juice Bar & Bakery and Zabka Café. Brooklyn's favorite neighborhood crawl returns to Malcolm X Blvd for an evening of food, music and fun. Bridge Street Development Corporation's first Feast BedStuy crawl of the spring is set to take place along Malcolm X Blvd, Tuesday, April 5. Over the past year, a slew of new neighborhood businesses have opened along the boulevard, including three new eateries. Feast BedStuy: Malcolm X Blvd will highlight these thriving establishments which are helping to reinvent the bustling corridor. Hundreds are expected to gather for the event along an expanded eight-block strip, running from Fulton Street to Putnam Avenue. Feast BedStuy: Malcolm X Blvd food and beverage tour is also a foodie's delight, with menu options ranging from French and Italian cuisine to Southern sweets and Polish fare. Participating venues include L’Antagoniste, Casablanca Cocktail Lounge, Daddy Green’s Pizza, Doc D’s, Khemistry Bar, Natural Blend Juice Bar & Bakery and Zabka Café. Specials from these neighborhood staples and newbies are sure to leave mouths watering and tastebuds begging for more. In addition, music will be provided by Love the Barber and an end-of-night party presented by Casablanca. $6 Pilsner tap beer with shot of house whiskey or tequila and $10 pizza pies at Casablanca Cocktail Lounge. In addition, foodies can register for the crawl to receive samples on behalf of Bridge Street. The Malcolm X Blvd crawl is part of a series of neighborhood crawls highlighting Central Brooklyn as a culinary destination via the district’s small businesses combined with the lush spirit and unique characteristics of the historic neighborhood. Funded by a New York City Department of Small Business Services grant, Feast BedStuy has hosted eight crawls over the past two years. The crawls support businesses along identified hospitality and commercial corridors in Bedford-Stuyvesant. 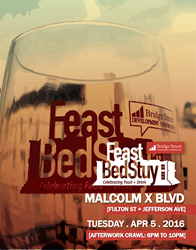 Bridge Street’s Feast BedStuy: The Malcolm X Blvd Edition takes place Tuesday, April 5, from 6-10pm. Look for the official Feast BedStuy signage on store windows to join the crawl or to enjoy Feast BedStuy at your own pace. For a complete list of participating venues, visit bsdcorp.org/feastbedstuy. Founded in 1995, Bridge Street Development Corporation (BSDC) is a faith-based, 501(c)(3) not-for-profit which evolved out of Bridge Street AWME Church’s more than 200-year-long history of community service. Now an independently-operated community development corporation, its mission is to build partnerships with businesses, government, and other community stakeholders to provide civic and economic opportunities to the residents of Central Brooklyn.